Support the motorcycle on the center stand on a level surface before starting any work. If the engine must be running to do some work, make sure the area is well- ventilated. Never run the engine in an enclosed area. The exhaust contains poisonous carbon monoxide gas that may cause loss of consciousness and lead to death. Gasoline is extremely flammable and is explosive under certain conditions. Work in a well-ventilated area with the engine stopped. Do not smoke or allow flames or sparks in the work area or where gasoline is stored. The following items require some mechanical knowledge. Certain items (particularly those marked * and **) may require more technical information and tools. Owners should consult their authorized Honda dealer. Perform the PRE-RIDE INSPECTION in the Owners Manual at each scheduled maintenance period. * Should be serviced by an authorized Honda dealer, unless the owner has proper tools and service data and is mechanically qualified. ** In the interest of safety, we recommend these items be serviced only by an authorized Honda dealer. At higher odometer readings, repeat at the frequency interval established here. Service more frequently when riding in unusually wet or dusty areas. Service more frequently when riding in rain or at full throttle. Replace every 2 years, or at indicated odometer interval, whichever comes first. Replacement requires mechanical skill. Remove the seat (page 13-25). Check the fuel lines for deterioration, damage or leakage. Replace the fuel lines if necessary. Check for smooth throttle grip full opening and automatic full closing in all steering positions. Check the throttle cables and replace them if they are deteriorated, kinked or damaged. 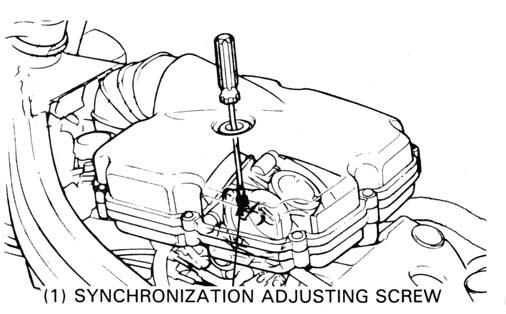 Lubricate the throttle cables, if throttle operation is not smooth. Measure the free play at the throttle grip flange. Throttle grip free play can be adjusted at either end of the throttle cable. Minor adjustments are made with the upper adjuster. 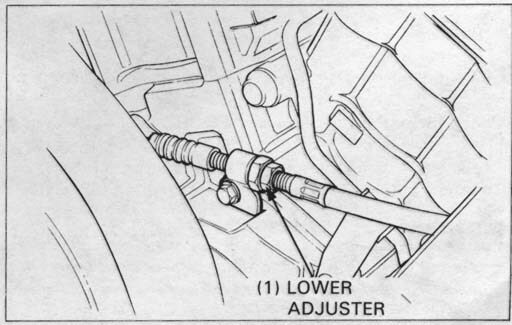 Major adjustments are made with the lower adjuster. Adjust the free play by loosening the lock nut and turning the adjusting nut. Tighten the lock nuts. Recheck throttle operation. Replace any damaged parts, if necessary. This model's choke system uses a fuel enrichening circuit controlled by a choke valve. The choke valve opens the enrichening circuit via a cable when the choke lever on the handlebar is pulled back. 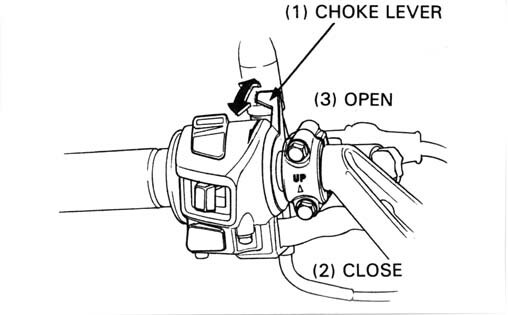 Check for smooth upper choke lever operation. 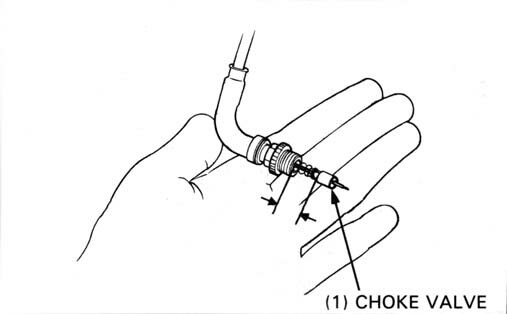 Lubricate the choke cable if the operation is not smooth. Remove the left and right choke cable boots from the choke valve nuts. Loosen each choke valve nut and remove the choke valve from the carburetor. Push the choke lever on the handlebar all the way up to fully closed and measure the distance between the ends of the choke valve and nut. It should be 10- 11 mm (0.39-0.43 in). Adjust the distance to within specifications by loosening the lock nut and turning the cable's elbow at the left handlebar switch housing. Tighten the lock nut securely and recheck the distance. Thread the choke valve in by hand and then tighten the choke valve nut 1/4 turn with a 14 mm wrench. 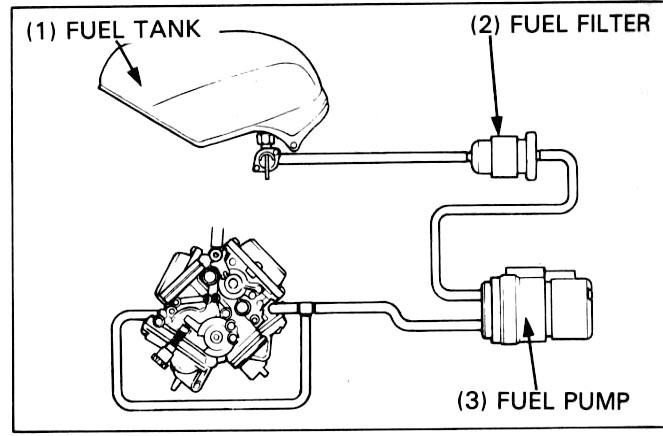 Remove the fuel tank (page 4-3). Remove the air cleaner case cover screws and cover. 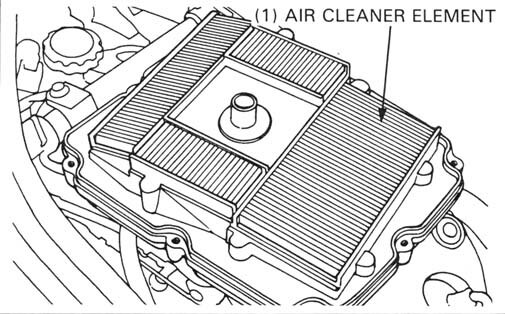 Remove the air cleaner element. Replace the element in accordance with the maintenance schedule. Also, replace the element any time it is excessively dirty or damaged. Remove the air cleaner element. Replace the element in accordance with the maintenance schedule. Also, replace the element any time it is excessively dirty or damaged. The crankcase breather drain; air cleaner case drain tube is behind the side stand. Remove the drain plug from the tube to empty any deposits. Reinstall the plug securely. Service more frequently when the motorcycle has been ridden in rain, at full throttle, or after it is washed or overturned. 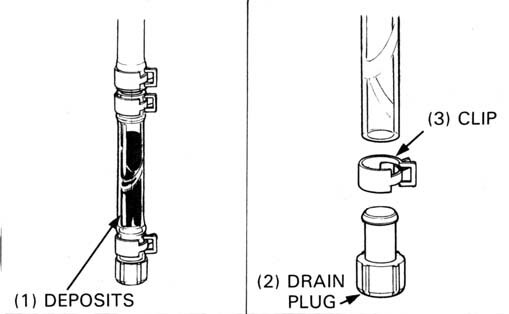 Service if the deposit level can be seen in the transparent section of the drain tube. Disconnect the spark plug caps and remove the spark plugs. 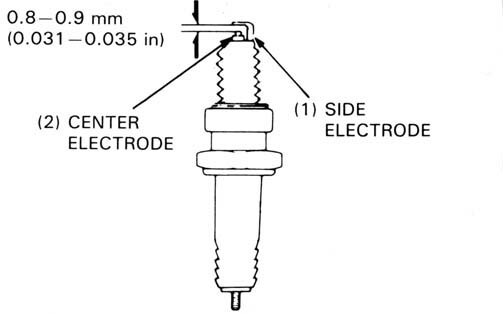 Measure the new spark plug gap with a wire-type feeler gauge. Adjust the gap if necessary, by bending the side electrode carefully. With the plug washer attached, thread each spark plug in by hand to prevent crossthreading. Continue tightening by hand until the spark plug bottoms. 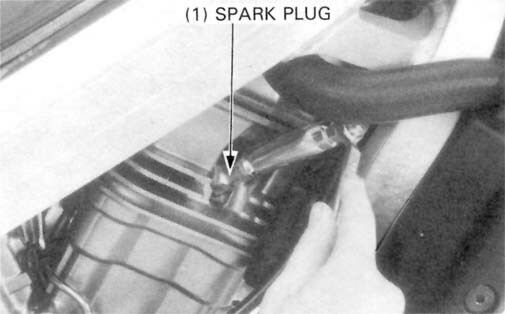 Then, tighten the spark plugs another 1/2 turn with a spark plug wrench to compress the plug washer. 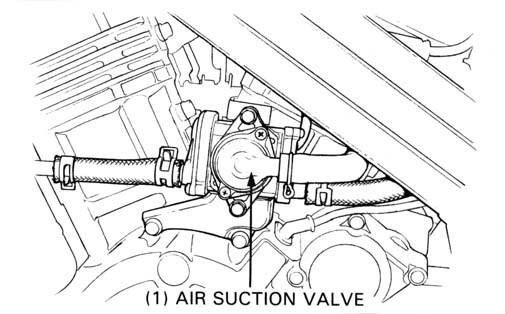 Inspect and adjust valve clearance while the engine is cold (below 35°C/95° F). 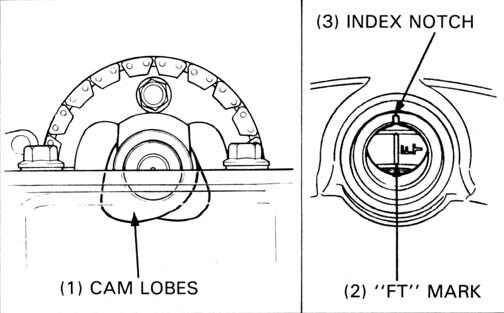 Rotate the flywheel counterclockwise to align the "FT" mark with the index notch on the left crankcase cover. Make sure the piston is at TDC (Top Dead Center) on the compression stroke and the cam lobes are all facing down as shown. Inspect the clearance of all three valves by inserting a feeler gauge between the adjusting screw and the valve. 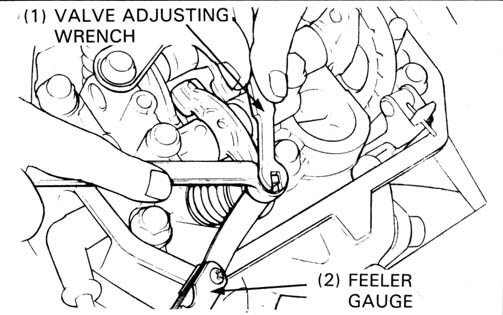 Adjust by loosening the lock nut and turning the adjusting screw until there is a slight drag on the feeler gauge. Apply oil to the nut and screw threads. Hold the adjusting screw and tighten the lock nut. 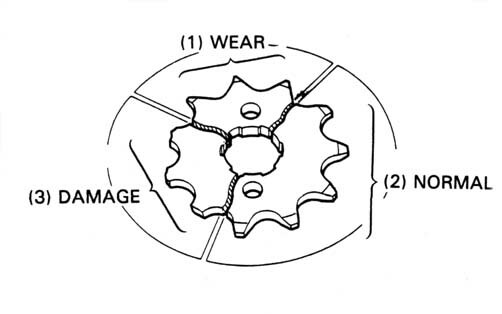 Rotate the flywheel counterclockwise to align the "RT" mark with the index notch on the left crankcase cover. 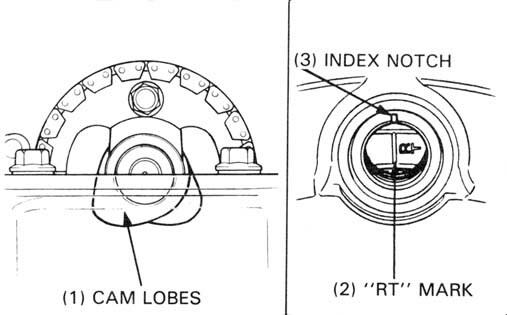 Make sure the piston is at TDC on the compression stroke and the cam lobes are all facing down. 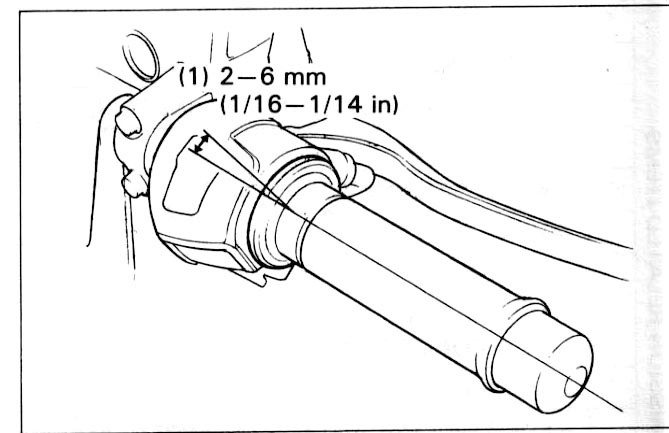 Inspect and adjust the valve clearance using the same method as for the front cylinder. Install the front and rear cylinder head covers. 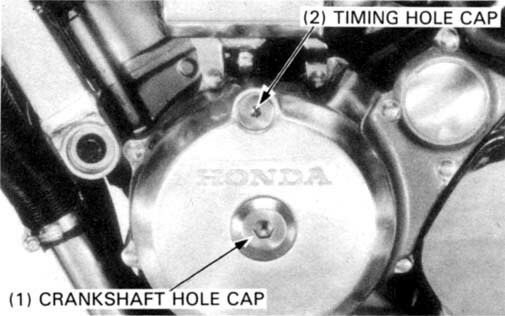 Apply molybdenum disulfide grease to the threads of the timing and crankcase hole caps, then install and tighten them. 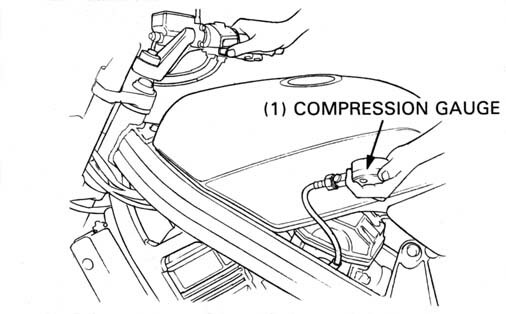 Perform this maintenance with the engine at normal operating temperature, the transmission in neutral, and the motorcycle on its center stand. Remove the rear fuel tank mounting bolt first, then remove the front side (page 4-3). Carefully raise the tank and support it in the frame using a suitable base. Remove the plug from the front cylinder intake port and install the vacuum gauge adapter. 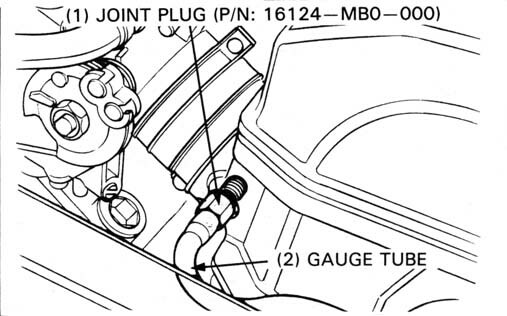 Remove the plug from the rear cylinder intake port and install the joint plug (P/N: 16124-MBO-000). Connect the vacuum gauge tube and vacuum gauge. 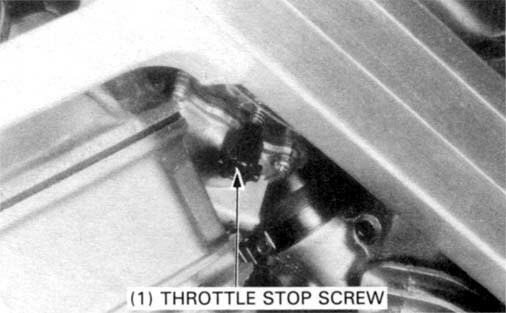 Warm up the engine and adjust the idle speed with the throttle stop screw. If the engine must be running to do some work, make sure the area is well-ventilated. Never run the engine in an enclosed area. Check that the difference in vacuum readings is 40 mm (1.6 in) Hg or less. 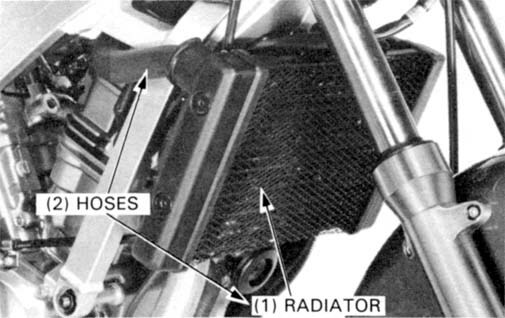 The rear cylinder carburetor is the base carburetor. If necessary, synchronize to the specification by turning the synchronization adjusting screw. Recheck the idle speed and synchronization. Disconnect the gauge and adapters and install the removed parts. Inspect and adjust idle speed after all other engine adjustments are within specifications. The engine must be warm for accurate adjustment. Ten minutes of stop-and-go riding is sufficient. Warm up the engine, shift to NEUTRAL, and place the motorcycle on its center stand. 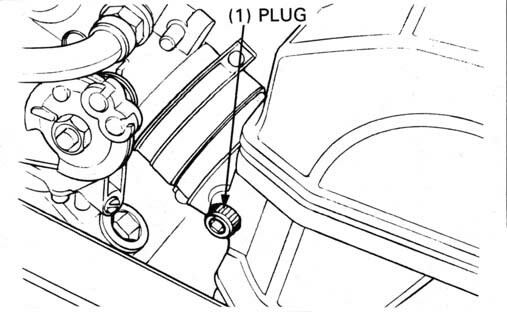 Turn the throttle stop screw as required to obtain the specified idle speed. Check the coolant level of the reserve tank with the engine running at normal operating temperature. The level should be between the UPPER and "LOWER" level lines. 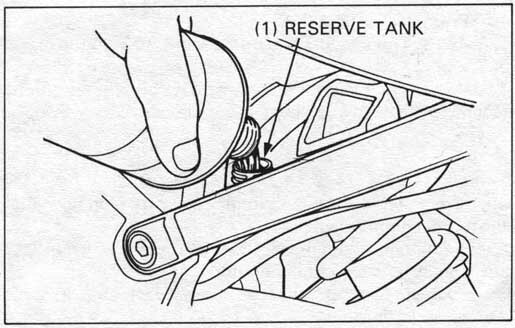 If necessary, remove the reserve tank cap. Fill up to the upper level line with 50/50 mixture of distilled water and antifreeze. Reinstall the reserve tank cap. 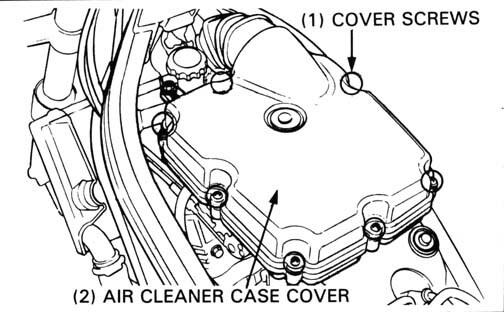 Remove the radiator shroud and check the radiator air passages for clogging or damage. 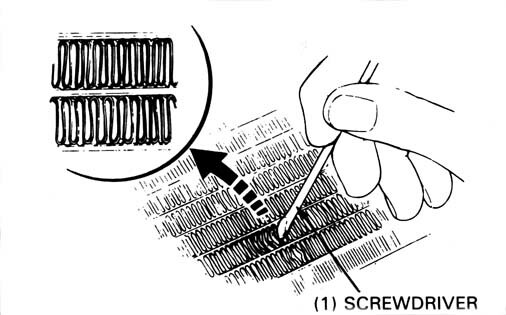 Straighten bent fins or collapsed core tubes with a small flat blade screwdriver as shown and remove insects, mud or any obstructions with compressed air or low-pressure water. Replace the radiator if the air flow is restricted over more than 30% of the radiator's surface. 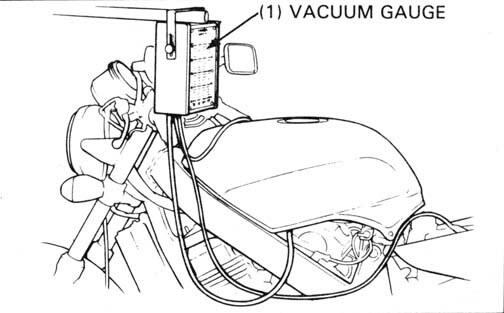 For radiator replacement, refer to page 5-5. Make sure the hoses are in good condition. Replace any hose that shows any sign of deterioration. Check that all hose clamps are tight. Stop the engine, disconnect both spark plug caps and remove one spark plug. To measure the cylinder compression of each individual cylinder, remove only one plug at a time. Turn the engine stop switch OFF. Insert the compression gauge. Open the throttle all the way and crank the engine with the starter motor. Crank the engine until the gauge reading stops rising. The maximum reading is usually reached within 4-7 seconds. If compression is high, it indicates that carbon deposits have accumulated on the combustion chamber and/or the piston crown. If compression is low, pour 3-5 cc (0.1 -0.2 US. oz) of clean engine oil into the cylinder through the spark plug hole and recheck the compression. If the compression increases from the previous value, check the cylinder, piston and piston rings. If the compression is the same as the previous value, check the valves for leakage. Check the air and vacuum hoses and tubes for bending or twisting and straighten if necessary. Check the system hoses and tubes for damage, deterioration, clogging or loose connections. Check the air suction valve for damage (page 4-17). 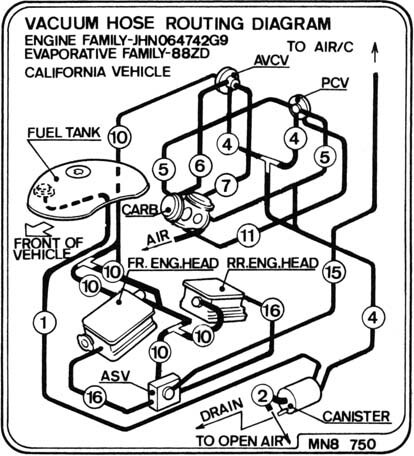 Refer to the vacuum hose routing diagram label for hose connections as shown below. Check the hoses between the fuel tank, canister, purge control valve (PCV), air vent control valve (AVCV), and carburetor for deterioration, damage or loose connections. Also check the tubes for bending or twisting and straighten if necessary. Check the canister for cracks deterioration, or other damage. 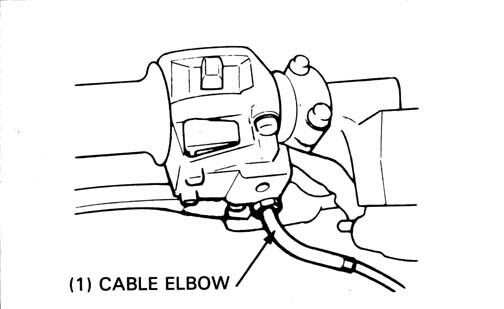 Refer to the vacuum hose routing diagram label for connections as shown right. Never inspect or adjust the drive chain while the engine is running. 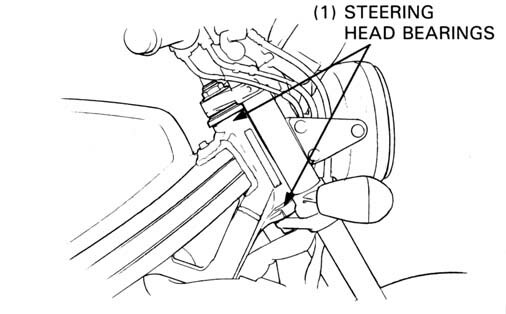 Turn the ignition switch OFF, support the motorcycle on its center stand and shift the transmission into neutral. 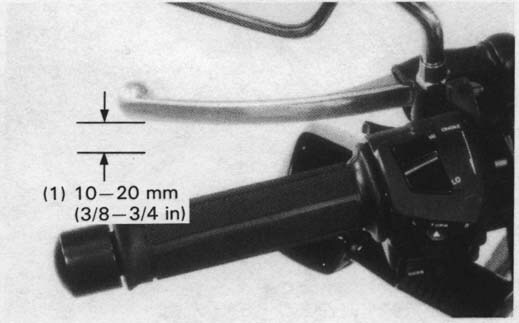 Place the chain slack gauge against the reference arrow on lower edge of the swingarm as shown. 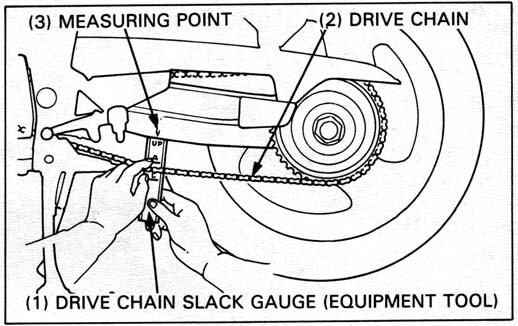 Pull the lower run of the drive chain down with your finger and check slack using the gauge. The chain slack gauge and eccentric bearing carrier wrench are supplied with this motorcycle. 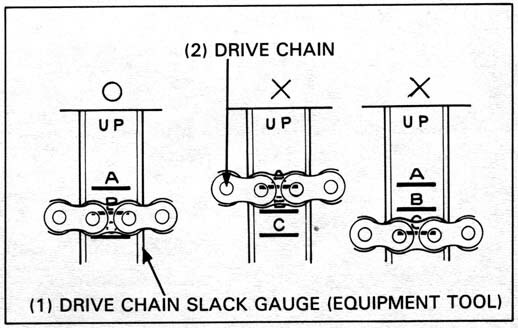 The chain slack gauge is using the "UP" mark facing the swingarm without fail. Make sure the upper edge of the chain is between lines A and B on the gauge. Loosen the eccentric bearing carrier pinch bolt. 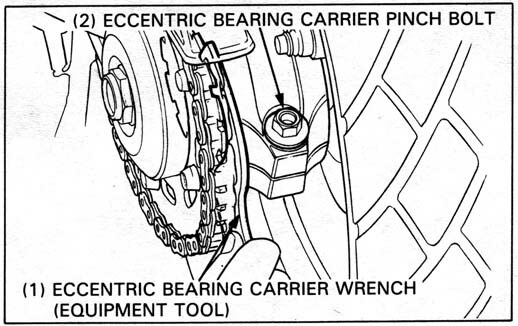 Turn the eccentric bearing carrier clockwise or counterclockwise by the bearing carrier wrench to obtain the drive chain slack as necessary. Tighten the eccentric bearing carrier pinch bolt. Lubricate the drive chain with SAE #80 or 90 gear oil. Check the chain wear label on the swingarm. If the red zone on the label aligns with the driven sprocket teeth after chain has been adjusted, the chain must be replaced. When the drive chain becomes extremely dirty, it should be cleaned prior to lubrication. Clean the drive chain with a non-flammable or high flash point and wipe dry. The drive chain on this motorcycle is equipped with small 0-rings between the link plates. The O-rings can be damaged by steam cleaners, high-pressure washers and certain solvents. 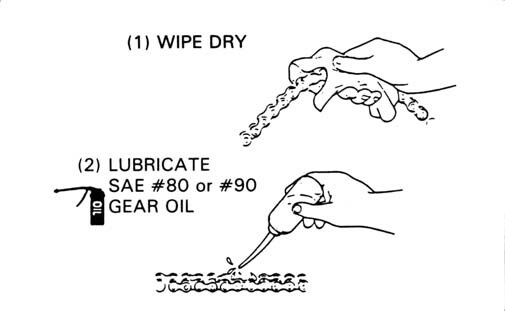 Lubricate only with SAE #80 or 90 gear oil. Commercial chain lubricants may contain solvents which could damage the rubber O-rings. Inspect the sprocket teeth for excessive wear or damage. Replace if necessary. Never install a new drive chain on worn sprockets or a worn chain on new sprockets. Both chain and sprockets must be in good condition, or the new replacement chain or sprockets will wear rapidly. 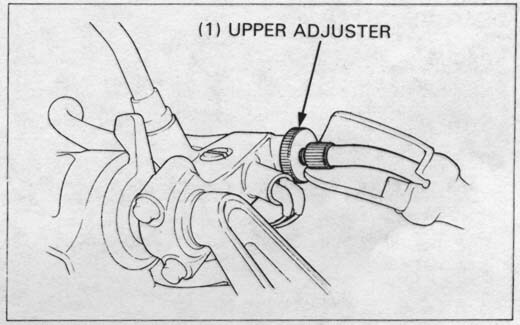 Check the front brake fluid level with the handlebar turned so that the reservoir is level. Check the front brake fluid through the sight glass. If the level is visible, check pad wear first; replace the pads if necessary. Then remove the cover, set plate and diaphragm. Fill the reservoir to the upper level with DOT 4 fluid from a sealed container. Check the system for leaks. 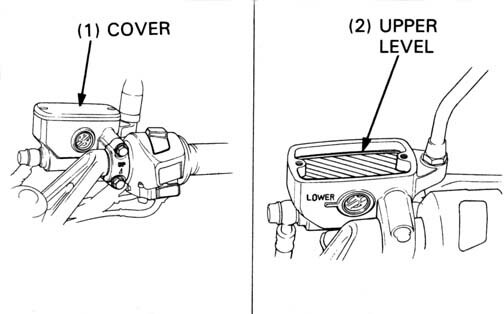 Do not remove the reservoir cover until the handlebar has been turned so that the reservoir is level. Do not mix different types of fluid, as they are not compatible with each other. Do not allow foreign material to enter the system when filling the reservoir. Avoid spilling the fluid on painted, plastic or rubber parts. Place a rag over these parts whenever the system is serviced. 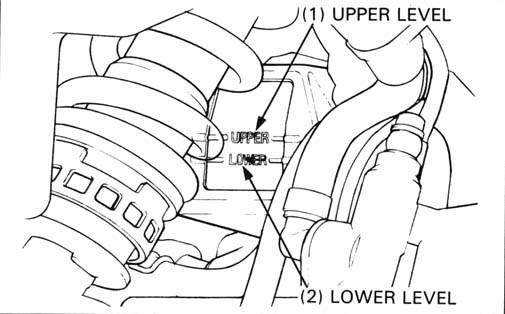 Check the rear brake fluid level after supporting the motorcycle upright on level ground. 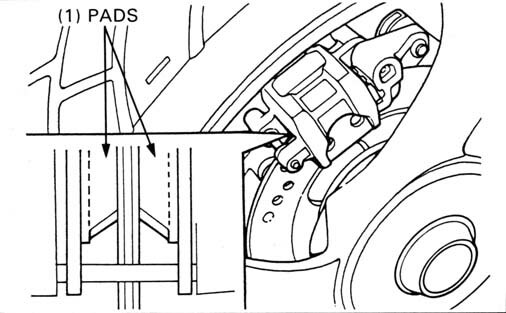 Check the rear brake fluid level; if it is near the lower line, check pad wear first; replace the pads if necessary. Then remove the cover, set plate and diaphragm. Fill the reservoir to the upper level with DOT 4 fluid from a sealed container. Check the system for leaks. 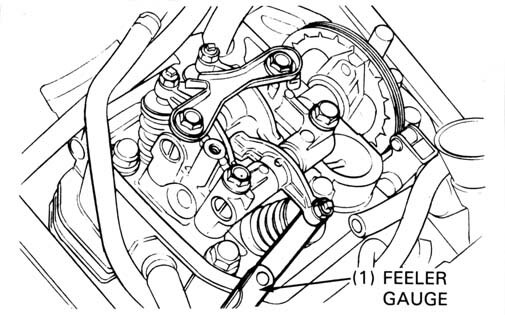 Check the front brake pads for wear, through from the lower end of the caliper. Check the rear brake pads for wear, through from the rear of the caliper. Always replace the brake pads as a set to assure even disc pressure. See section 14 for brake pad replacement. 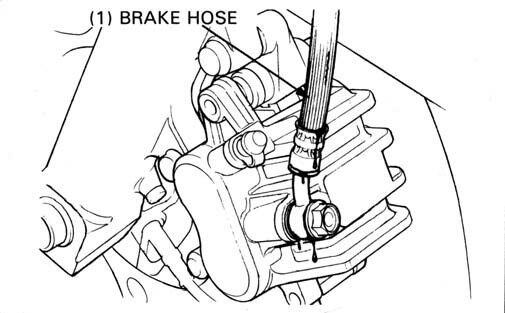 Inspect the brake hoses and fittings for deterioration, cracks and signs of leakage. Tighten any loose fittings. Replace hoses and fittings as required. Check the rear brake pedal height. 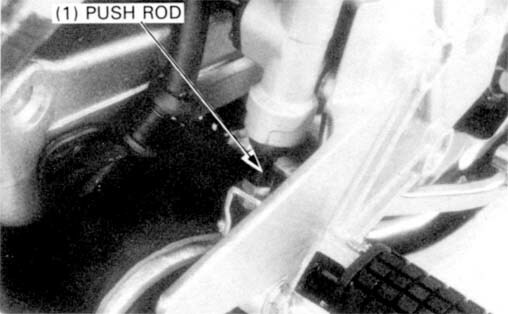 To adjust the brake pedal height, loosen the lock nut and turn the master cylinder push rod. Tighten the lock nut. 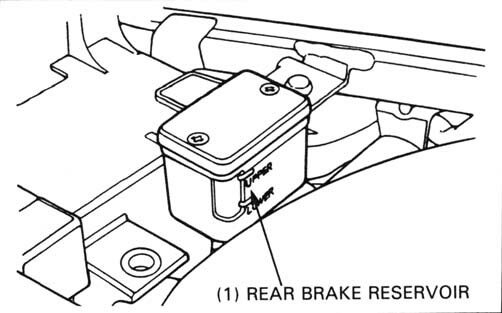 Adjust the brake light switch after adjusting the brake pedal height. 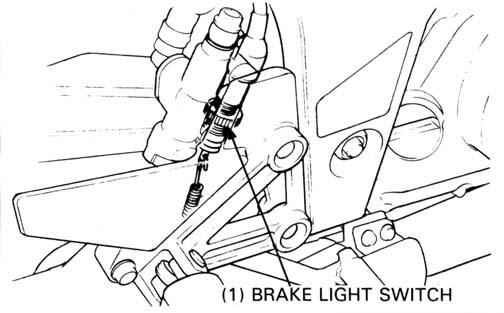 Perform the rear brake light switch adjustment after adjusting the brake height. The front brake light switch does not require adjustment. Adjust the brake light switch so that the brake light will come on when brake engagement begins. 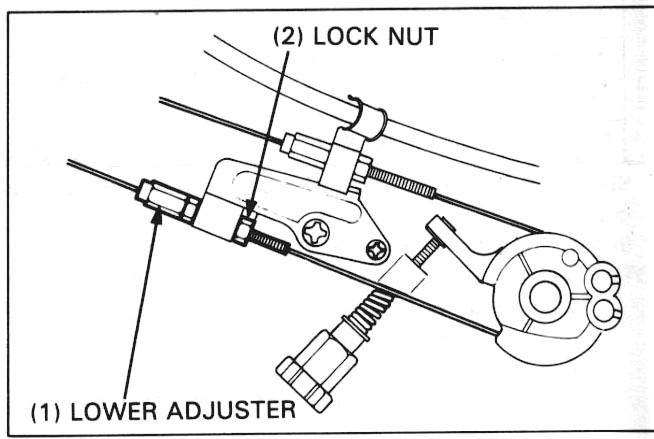 Adjust by turning the adjuster while holding the switch body. Tighten the adjuster lock nut and recheck the brake light switch operation. 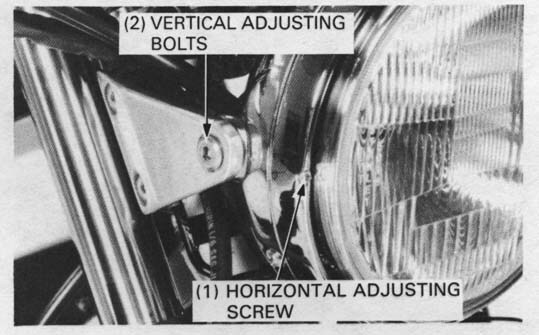 Adjust vertically by loosing the headlight mounting bolts. Adjust horizontally by turning the horizontal adjusting screw. Adjust the headlight beam as specified by local laws and regulations. An improperly adjusted headlight may blind oncoming drivers, or it may fail to light the road for a safe distance. Measure the clutch lever free play at the lever end. 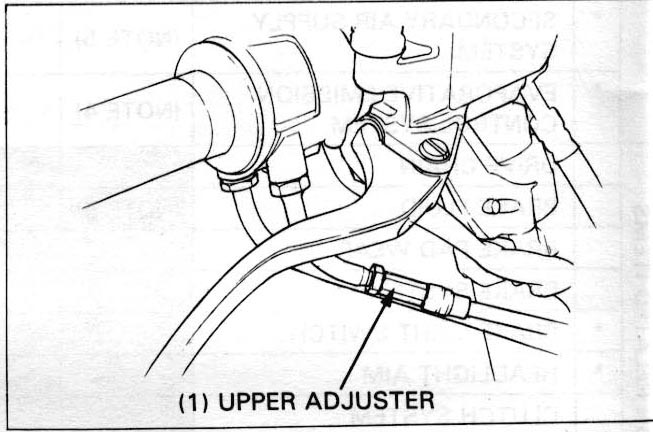 Minor adjustments are made with the upper adjuster. Pull the lever cover back, loosen the lock nut and turn the adjuster to obtain the specified free play. Tighten the lock nut and install the cover. Loosen the lock nut and turn the adjusting nut to obtain the specified free play. Tighten the lock nut and check the clutch operation. Check the rubber pad on the side stand for deterioration and wear. Replace the rubber pad if wear extends to the wear line. When lowered, the stand should move easily to the first stop, then lock forward to support the motorcycle when the pad touches the ground and the weight of the motorcycle is supported. 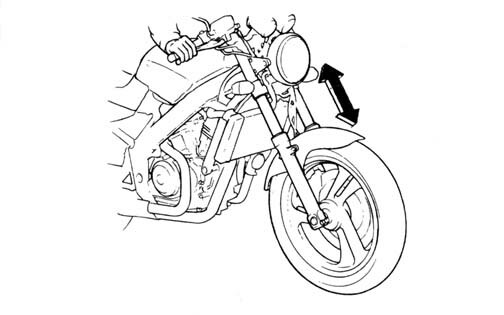 When the motorcycle is raised, the stand should automatically move to the first stop, then retract easily when kicked. Remove the return spring at the retracted position. Remove the pivot bolt and side stand. - inside of the pivot and pivot collar for wear or damage. - pivot dust seal for damage. Lubricate the pivot area with clean grease and reassemble the side stand. Install the dust seal lip spring is facing out. Make sure that the dust seal lip spring is seated securely. 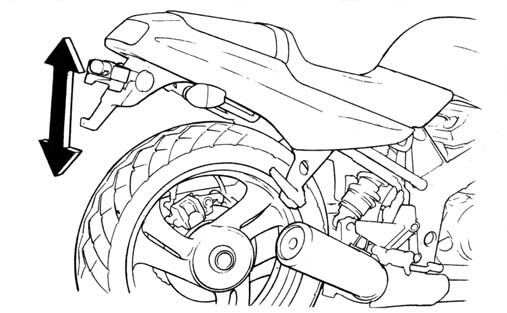 Check the side stand operation as indicated above. Check the suspension action by compressing it several times. 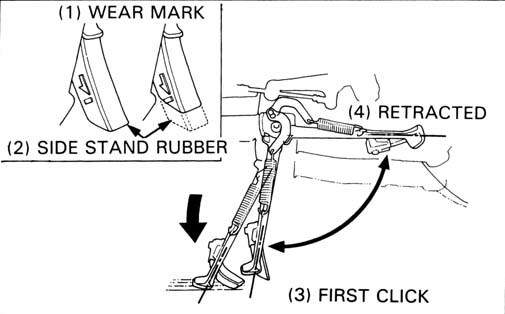 Check the entire fork leg assembly for signs of leaks or damage. Replace any components which are unrepairable. Tighten all nuts and bolts to the specified torque value. Do not ride a vehicle with faulty suspension. Loose, worn, or damaged suspension parts may affect stability and rider control. Check the action of the rear suspension components by compressing the suspension several times. Check the entire suspension assembly, being sure it is securely mounted and not damaged or distorted. 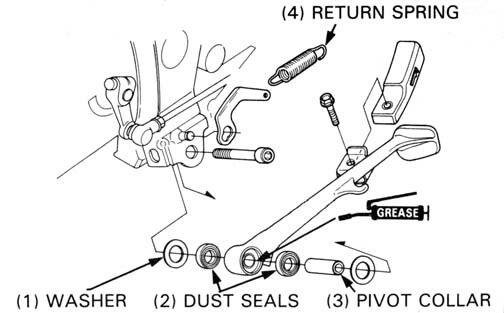 Check for worn swingarm bearings by grabbing the swingarm, and attempting to move the swingarm side to side. Replace the bearings if any looseness is noted (page 13-19). Tighten the bolts, nuts and fasteners at the intervals shown in the Maintenance Schedule (page 3-3). Check that all chassis nuts and bolts are tightened to their correct torque values (page 1-5 and 6). Check all cotter pins and safety clips. Tire pressure should be checked when the tires are COLD. Check the tires for cuts, imbedded nails, or other sharp objects. 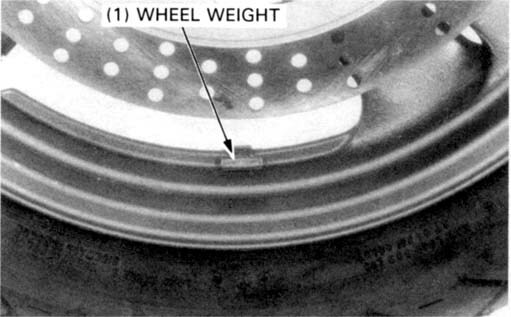 Check the front and rear wheels for trueness (Section 12 and 13). Measure the tread depth at the center of the tires. Check that the control cables do not interfere with handlebar rotation. Check that the fork pivots freely from side to side. 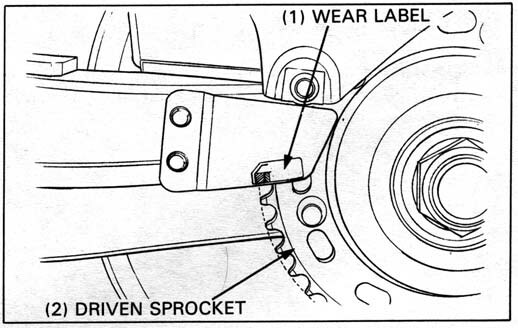 If the fork pivots unevenly, binds, or has vertical movement, inspect the steering head bearings (Section 12).